We visited and stayed at numerous campgrounds on the Island, and hope to give you an overview that will provide you with a lot of information that we could not find elsewhere before we travelled. There seemed to be a lot of general information on places to go but when it came to camping there was not very much detail on the sites and amenities. Hope this helps fill in some of your key questions. American River is a small township about 30 minutes from Penneshaw. 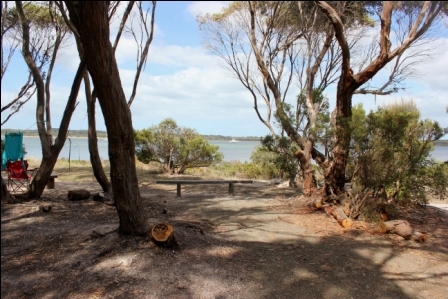 The campground is on the foreshore and is a council run campground. “Boiling Billy” publications recommended this at one of the best campgrounds on Kangaroo Island, so we had high expectations, though we struggled to find more information on it leading up to our trip. The site overlooks the pretty area of American River, dotted with fishing boats. A very picturesque area to gaze out upon. It is not a river, despite its name. The campground has no designated numbered sites, but I would estimate it would hold up to 15 campers, though that would be at capacity. It works on a “first come, first served” basis. The main road into town runs right next to the camp and there is very little privacy from the road. Good news is that the road was not that busy at night, so noise did not impact us but if you have small children, watch them as there is no fencing between the camp and the road. There were registration fees when we visited, but as these can change at any time, we suggest you check this Council site for further clarification. There are 4-5 powered sites, all lined up directly next to each other with no screening. These sites are very close to the toilets. They did not have any overhanging foliage, so you could get your van in this section, but unlikely anywhere else but this powered section of the campground. I think caravans could struggle parking in this area if it was busy. The turning room for your vehicle would be extremely limited, and once you have set up your caravan, not a lot of space for your car. The unpowered sites are spread over a relatively small area. There appears to be some designation of sites, but it’s pretty vague – just a bench-like structure which we assume meant that this was the camp site. But as they were all so close together and small (if you go by the theory that this is a campsite marker), we spilled across into another campsite plus we had to have somewhere to park our car. It is all very haphazard. There was plenty of shade provided by small native trees, but no privacy at all. It looks like a number of trees have recently been cut down (all the stumps were fresh) to make more room for tents, but in doing so, the council may have inadvertently made this area less appealing. Most camper trailers had no problems in setting up as the ground is quite level. We were there at the start of peak time, and surprisingly not that busy (and for the rest of our trip, this was the case). Whilst staying here, there were around 6 campsites occupied, and apart from the powered sites, other campers came in to try and find a spot but it would have been too cramped, and when travelling the distances many of us have to get to KI, the last thing you want is to be stuck on top of another campsite. We too, would have moved on if we had come across this campground when it had more occupants. Luckily for us, we had moved in when there was only one other campsite occupied. There is a toilet block which has 2 toilets and 2 showers for male and likewise for female. The condition was average though looking a bit dated and tired. As the campground was not busy, we never had to compete with anyone to get to a shower or toilet. In busy peak times, this amenity block would struggle with the volume of campers and other users. The showers were very hot which was great news. They work on the basis that for 3 minutes you have hot water, and then when that time ends, you must wait 5 minutes to restart the hot water. When we were there, it was hot water for as long as you needed it! Bliss. A new, very clean and modern BBQ facility with cover and outdoor settings were provided, and there is a tank at the back where you can access rainwater from, but please use sparingly, as water is precious on the Island. We treated the water before drinking it. This BBQ area is lovely and a great addition. It is available for daytrippers as well. Also, there were 2 covered outdoor settings facing onto American River, also very new and great to sit there and have your breakfast. We did not need to set up our own table and chairs as we could utilise these tables provided. 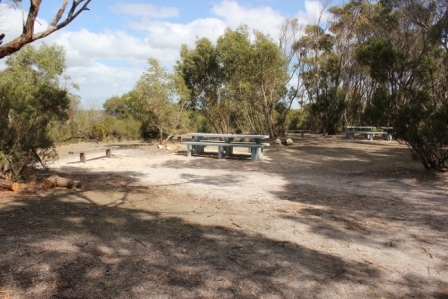 Scattered throughout the campsite are large (and ugly) grey concrete tables and benches. They certainly stand out when you drive in to camp (and not in a good way). I think the campground could have benefitted without their addition but we did use it to set up our cooking facilities. Note: Because this is such a public campground, and the toilet block is right next to the road and jetty, everyone uses these toilets – not just the campers. So you have a wide variety of people (locals, fishermen, tourists, truckies, anyone) with ability to access toilets and showers any time of day or night, as it sits just by the road. It made us hesitant as parents to let our children go to the toilet without supervision, despite it being close to our camp. Lots of garbage bins and recycling bins everywhere, so no excuse for not leaving your campsite spotless. Campfires allowed at approved times of year. Dogs on leash allowed (though how they would police that is a mystery). We saw no wildlife though I have read on other sites about the large amount to be seen there. It was good for us because we were out all day doing activities and sightseeing. We came back late in the day but I could not imagine sitting around this campsite as I can do at other places. It was not a place where the children could run off and play, as it is built up area. There is plenty of water but no swimming and no beach and whilst it is very pretty, it was not what I had expected. Coming to Kangaroo Island, I wanted a bit more isolation in a campground and definitely some space between myself and my neighbours. Thankfully, our neighbours at American River were lovely people! Use this campground as your base for this part of the Island, or if you plan to do a lot of fishing. But don’t think of this as a campground where you can unwind totally, because your neighbours may be a bit too close, or loud, and the road reminds you that you are not truly in the bush. As mentioned above, this campsite is used by non campers as well, who might just use the facilities during the day/night without actually camping there. A reader has told of their recent problems with daytrippers who took over the area, plus men in the women's toilets, and when confronted, threats of violence against the campers. We reiterate what we mentioned above with the public toilet/showers availability - we recommend that you use caution, especially with children, and do not use this area if travelling alone. There are no caretakers at the campground. Whilst problems can occur at any campground, it's better to be warned about a potential issue than not know at all.